Back in May, we heard that the Lions had not had any substantive contract talks with WR Golden Tate, who is in his contract year and whom the Lions dealt to the Eagles at last week’s trade deadline. However, Ian Rapoport of NFL.com, citing Dave Birkett of the Detroit Free Press, says that the Lions did try to extend Tate before trading him, and Tate believed that a deal was close (Twitter link). As of right now, there are no reports as to the terms of that failed extension, but Tate is said to be seeking a contract in the neighborhood of Jarvis Landry‘s five-year, $75.5MM deal with the Browns, so it stands to reason that Detroit’s offer was somewhere in that ballpark. Landry is about four years younger than Tate, so despite Tate’s track record of quality production, he may not land as lucrative of a deal as Landry’s, but given the fairly unimpressive list of wide receivers eligible for free agency this offseason — not to mention the booming wide receiver market — Tate will be richly compensated one way or another. Detroit GM Bob Quinn held firm in trade talks with opposing clubs, but when the Eagles met his asking price for Tate, Quinn felt obliged to pull the trigger. 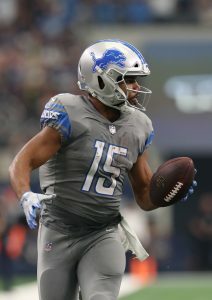 The Lions will move forward with Marvin Jones and exciting second-year player Kenny Golladay, while Philadelphia will add Tate to an already strong group of wideouts (as we learned earlier today, the Eagles did try to trade for the Jets’ Robby Anderson, but New York elected to hold onto its best deep threat, so the defending champs shifted their focus to Tate). In seven games this year, Tate has 44 catches for 517 yards and three touchdowns. He is on pace to crack the 1,000-yard barrier for the third consecutive year, and while he does not present the vertical ability that Anderson would have, the Eagles will surely appreciate his versatility and ability to make contested catches.